This program allows the output from a PLINK association analysis to be visualised. 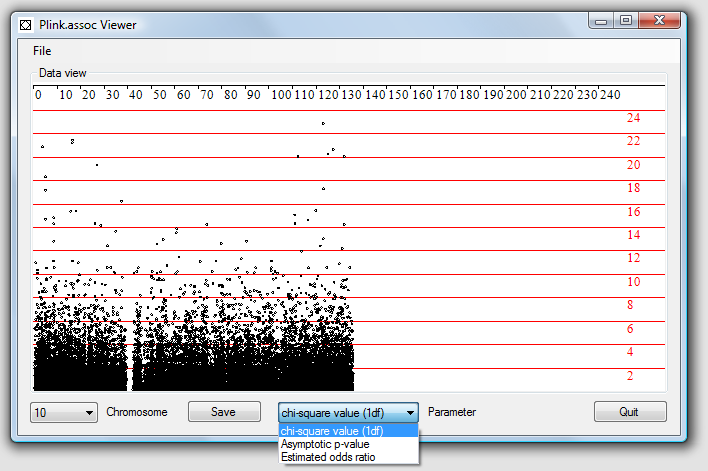 Each analysis calculates the 'chi-square value (1df'), 'Asymptotic p-value' and 'Estimated odds ratio' results for each SNP. These results are viewed one chromosome at a time by selecting the analysis type from the drop down list in the centre of the window and the chromosome from the drop down list in the lower left corner of the window. The 'chi-square value (1df') and 'Estimated odds ratio' are displayed on a linear axis, while 'Asymptotic p-value' values are shown as the negative Log 10 of the value. Data for a region can be exported as either a tab delimited text file or a html web page. To export data place the cursor at one side of the region and with the mouse button pressed move the cursor to the other end of the region. Then press the Save button and select the correct file extension and enter the name of the file to save the data too. The data in a plink.assoc file is arranged as 10 fixed width columns as described in Table 1, the second row states the width of each column, while the third row shows example data. If you analyse the data with the --ci X arguement the file will contain and extra 3 columns, these will be ignored by this program. Note: this program requires the .NET framework version 2.0 to be installed (available through Windows Update or here). Purcell S, Neale B, Todd-Brown K, Thomas L, Ferreira MA, Bender D, Maller J, Sklar P, de Bakker PI, Daly MJ, Sham PC. (2007). PLINK: a tool set for whole-genome association and population-based linkage analyses. Am J Hum Genet. 81(3):559-75.